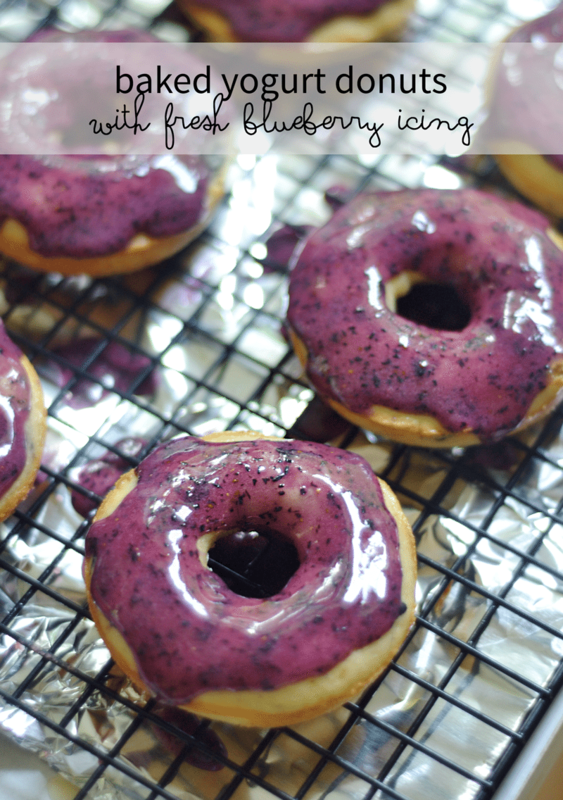 These baked yogurt donuts with fresh blueberry icing are fast and easy for busy parents! 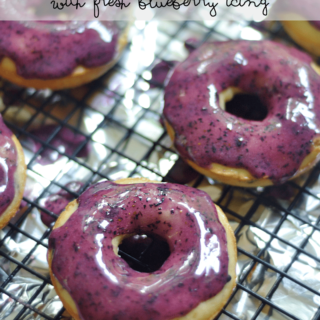 Kids love them because of their sweet and bright blueberry flavor AND fantastic color. You’ll love them because you can make them up in under 20 minutes. There are days that start out so very, very horrid that there is nothing to do but crawl into bed and start over. By the way, do you ever do that with your family? Literally tell everyone to go back in their bed and restart? I have. It surprisingly works. I’m guessing the ridiculousness of it is so humorous it can’t help but get everyone smiling. Next time you have a bad start to the day literally send everyone back to their beds to “restart”. See if that doesn’t bring a smile to your family and jump start everyone’s moods! No truly. Donuts are a guaranteed happy day maker. Look at them. They are literally little circles of sugar and goodness just waiting to be consumed. It’s as if God created us with brains that are powered on donuts. Granted, most of us have diets that aren’t donut friendly. Me included. But that doesn’t stop me from figuring out ways to enjoy them! 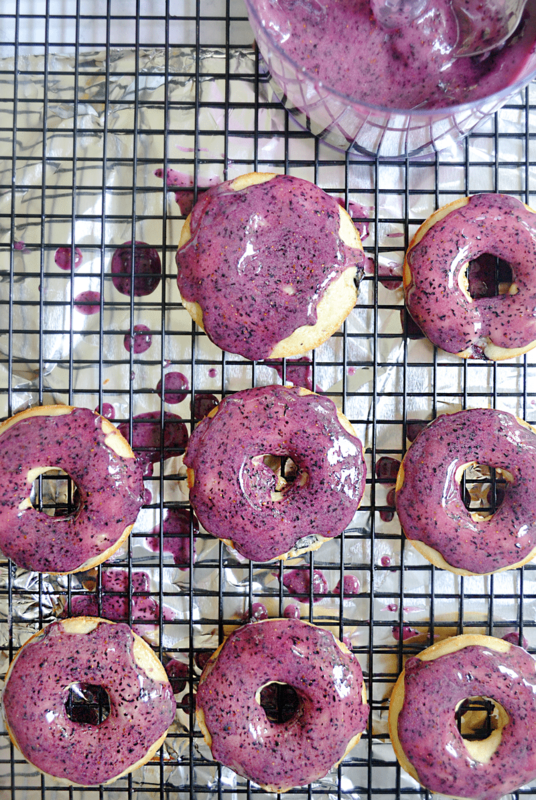 This recipe is a bit gentler on tummies than most donut recipes. Still a sugar high, without question. Still gluten-heavy, for sure! But they are baked rather than fried (in my opinion, the only way to have donuts! ), use Greek yogurt and honey for a majority of butter and sugar, and fresh blueberries make up most of the icing (ignore the powdered sugar and you could say the icing is healthy :)). Okay, I’m stretching. These are still not a replacement for a good, healthy breakfast. Except on a horrid start to a horrid day. Then anything goes. Just because I adore the color of this icing. It’s the prettiest, happiest purple of all the purples! Next time your day is off to a horrid start, take a moment to pause and reset. Your day isn’t going to end because you halted for a few extra moments. If anything, it will be significantly better because you broke the cycle of crazy bad moods and spewing words of anger (no, I don’t do that either :). Pause in those crazy moments and get a hold of your life. It’s YOUR life, own it, don’t let life own you! If donuts are needed for a moral boost hey… we can sacrifice! Mix the flour, sugar, baking powder, and salt together. Make a well in the center of the dry ingredients and add the eggs, honey, yogurt, and extract. Stir up that center as best you can without getting dry ingredients in. Gently fold the dry ingredients into the wet just until mixed. Add the melted butter and stir well. Do not over stir donuts, you'll get rubbery and gross ones! Spray a donut pan well with Pam. After a couple minutes of cooling, flip them out on to a cooling rack. 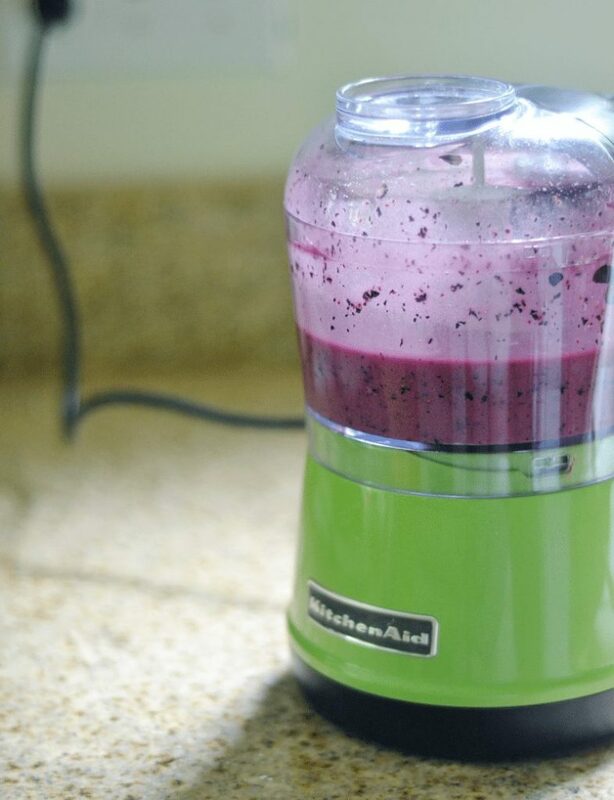 In a food processor puree the blueberries, add the powdered sugar, and puree until blended well. If needed, add additional powdered sugar. With a spoon, or by dipping the donut into the icing, spread a generous amount of icing on each donut and place on a rack or parchment paper to drip. 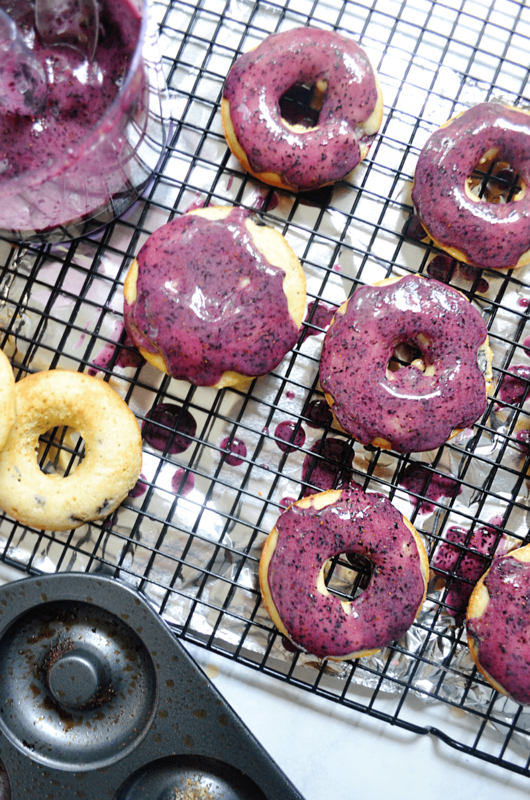 Donut Pan, Food Processor, and cooling racks. 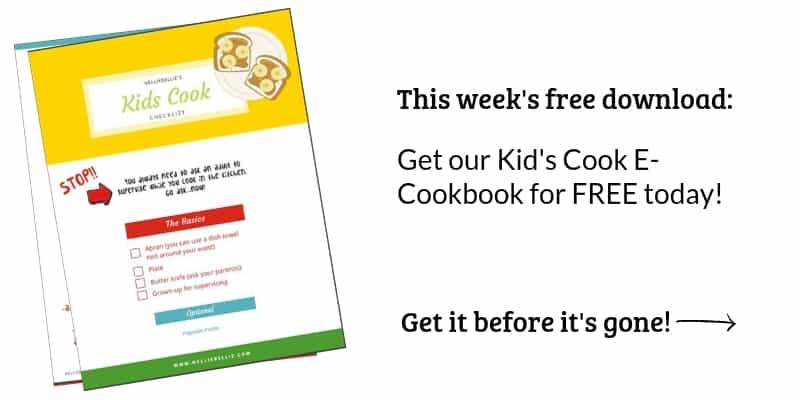 We just made these this weekend. They were the request of my boy LEvi’s birthday “cake”. I would try sour cream instead. Hi! I did make them and I did use sour cream. I also didn’t have baking powder so had to use soda. They were not bad at all. My hubby liked them. I actually used mini muffin tins, threw them in a gallon ziplock bag once cool and tossed them with a quarter cup of cinnamon sugar. Yum! I did learn I should only have kept them in the oven for 7-8 minutes, instead of 10 minutes. They are a little dryer. I made sure not to stir too much. Next time I will do the yogurt and baking powder, and I will make them cinnamon again. I think they will go over well next week at Church since we are in charge of fellowship. Going to try them there. I’m so glad! I like the addition of cinnamon sugar, that’s a tasty idea! I hope they turn out well for your fellowship. I love being able to bake donuts, makes things so much easier! You are so absolutely right! I love your donuts, will give them a try for sure!